An online closeout retailer now, but not for long. Overstock.com (NASDAQ:OSTK) is an interesting case in the burgeoning e-commerce industry. The seller of discount home goods, apparel, and electronics was eclipsed long ago by much larger names like Amazon and Wayfair, leaving the company with lackluster sales and at-best thin profit margins. Overstock's management has been candid about the situation and has a plan to return to relevance. The company is pivoting toward a blockchain operation -- a transformation that on one hand makes sense but on the other is disturbing as it carries risk of total implosion. Looking at Overstock's business results through the first three quarters of 2018 clears up why the company's top team wants to change gears. With so many online retailers willing to operate on tight or non-existent profit margins, Overstock claims it hasn't been able to grow much. Data source: Overstock.com. YOY = year over year. Overstock's revenue growth trails behind the 10% e-commerce sales growth reported by the U.S. Census Bureau through October this year. Nevertheless, online retail hasn't been a total bust. The company still grew sales 6%, even while its focus has shifted to new technology rather than its primary retail concern. Profit margins just aren't there, though, and Overstock is tired of playing the expansion-at-all-cost game with its much larger peers. Thus, management said it's still working with possible suitors to sell the business. There hasn't been much comment on that process since it's still a confidential one, but in the meantime, Overstock continues to develop its blockchain wholly-owned subsidiary Medici Ventures. That's where the big year-over-year increase in operating expenses are coming from as Overstock says it has invested a total of $175 million into various blockchain technologies through Medici. Medici Ventures is a consortium of start-ups with plans to develop and market blockchain technology in everything from land titling in undeveloped countries to payment processing to digital voting management. And $115 million of the $175 million invested in Medici has gone specifically to tZERO, a capital markets security token that completed an initial coin offering in October with a trading exchange for the tokens set to open in 2019. However, Overstock doesn't report any revenue from Medici because any blockchain-related sales are immaterial at this point. That didn't prevent the stock from undergoing a quick boom and bust round-trip journey starting in late 2017 after management announced its intentions to offload the digital retail business. 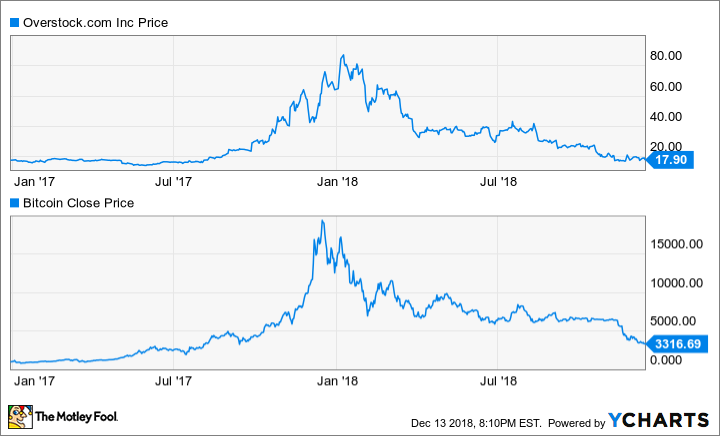 Share prices surged along with the value of many digital currencies, only to decline again in tandem with them throughout 2018. Nevertheless, Overstock's aspirations in the nascent blockchain industry are a high-risk proposition, and how the company will monetize its sizable investments (and how much money can be made from them) is unclear. What remains is an e-commerce business that's lagging behind its larger peers -- one that's being sold off to an as-yet unknown buyer for an unknown price. That makes shares of Overstock.com little more than a gamble at this point.